Xiapex (also known as collagenase) is a minimally invasive injection treatment for patients with Dupuytren’s disease. In the past open surgery was the gold standard treatment for patients with significant deformities of their hand/fingers as a result of Dupuytren’s disease. Treatment with Xiapex offers a less invasive way of dealing with contractures. The drug is made of a special enzyme mix that can digest the diseased tissue. 24-48 hours following an injection with Xiapex the finger can be straightened (typically under local anaesthetic). Patients can mobilise and use their hand straight away. Not every patient is suitable for treatment with Xiapex, careful patient selection is the key to success. Platelet-Rich-Plasma is a fairly new and innovative treatment. 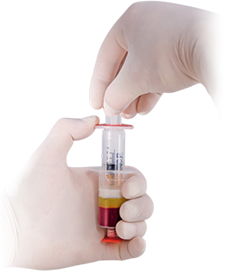 PRP is a concentrated preparation of platelets and their associated growth factors that is prepared from a small blood sample. PRP is thought to promote tissue healing and regeneration by delivering those growth factors in a high concentration to the treated area. Typical indications include soft tissue conditions like tennis and golfers elbow as well as shoulder problems like impingement and rotator cuff tendinopathy. PRP can also be used for the treatment of early arthritis. Taking the blood sample and carrying out the injection can be done during a single outpatient appointment. This is a new and promising technology harvesting the healing powers of the body’s own fat. A small sample of fat from the abdomen is harvested with a needle and is then specially prepared. The resulting fluid is then injected into the affected joint. Treatment with Lipogems is thought to aid natural healing processes by supporting the repair and regeneration of damaged tissues. The treatment is typically used for patients with painful arthritis. The early scientific results are promising. Only time will tell whether the treatment will deliver on it’s early promise in the long-term. A number of websites claim, that Lipogems is a stem cell treatment, but this is controversial and not strictly the case. For patients with painful arthritis who would otherwise need a joint replacement, treatment with Lipogems can potentially improve pain and function for a lengthy period of time. nSTRIDE autologous protein solution is a groundbreaking new treatment for patients with arthritis. The treatment is somewhat similar to PRP treatment: a blood sample is obtained and centrifuged, resulting in a fluid sample containing a high concentration of growth factors, anti-inflammatory cytokines and white blood cells. The main difference between PRP and nSTRIDE APS is the high concentration of white blood cells in nSTRIDE. The early scientific results are promising. Particularly patients with arthritis who would otherwise require joint replacement surgery can benefit from an injection with nSTRIDE APS. This is a minimally invasive way of carrying out carpal tunnel release surgery. While traditional open surgery requires an incision in the palm, endoscopic surgery offers the advantage of a much smaller incision in a more advantageous location in the forearm. This results in a quicker recovery with faster return to function and to work. For patients with severe arthritis at the base of the thumb surgery is often the treatment of last resort. Traditionally this has involved the removal of the trapezium bone – a procedure therefore known as a trapeziectomy. While the procedure works well in the long term, it often takes patients a long time to recover. The Cartiva implant offers a pathway to a quicker recovery with good long-term outcomes. The implant is made from a material that’s similar to soft contact lenses. The implant helps to separate the worn-out joint surfaces, thus reducing pain. The material mimics the natural joint cartilage and aids in smoother and less painful joint movements. Both tennis elbow (also known as lateral epicondylitis) and golfers' elbow (medial epicondylitis) are conditions that cause pain in the elbow - either on the outer side (tennis elbow), or on the inner side (golfers' elbow). Both are overuse conditions - the daily use causes more damage to the tendon than the body can repair. The result is microtearing in the tendon. In tennis elbow this affects the tendons that extend the wrist and fingers, particularly the so-called ECRB tendon. These tendons are attached to the prominent bone on the outer side of the elbow. The ECRB tendon is located in a deeper layer, seems to get less blood supply and is more prone to mechanical irritation when it moves over the bone. Golfers elbow affects the tendons responsible for bending the wrist and rotating the forearm. These tendons originate from the prominent bone on the inner side of the elbow. In the past it was felt that tis is an inflammatory condition, but the changes seen in the diseased tendon under the microscope point towards overuse and repetitive strain as the main problem.